Last night I took a little trip to St. Paul and saw some classic musical theater. It was a brand new show, but a classic style. 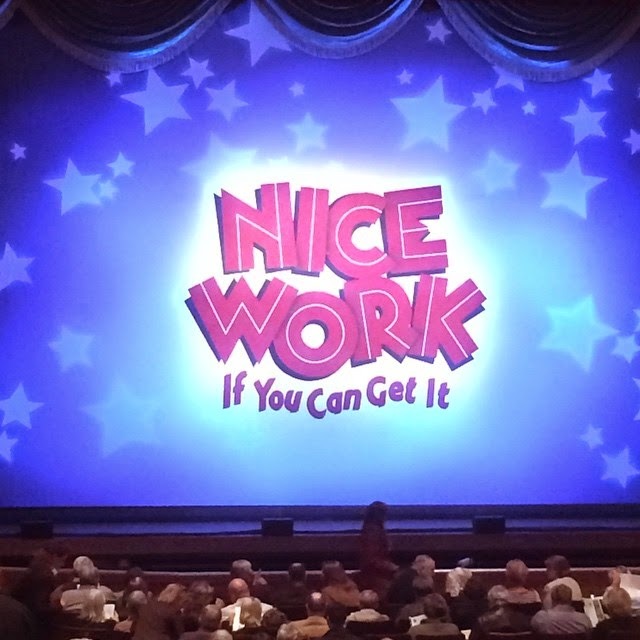 Nice Work If You Can Get It is a classic new musical in the vein of Crazy for You. In fact, they both use only music of Gershwin as their score. So, what is it about? With the music of Gershwin, gorgeous chorus girls, hunky chorus boys, and a charming set...does it really matter? Boy meets girl bootlegger while drunk, falls for girl even though he is getting married to his third, or maybe his fourth wife the following day, bootlegger steals his wallet and hides 400 cases of illegal booze (did I mention it takes place during the prohibition?) at his Long Island mansion that he never uses...except for his honeymoon the next day. Hi-jinks ensue. Dances are danced, songs are sung, laughs...oh so many laughs...and sighs of "awww, how sweet." This show played originally on Broadway starring Matthew Broderick, and the amazing Kelly O'Hara. It is directed and choreographed by Kathleen Marshall, who did a great job keeping the pace, and keeping the eyes entertained. Here is the clincher though - it only plays through Oct. 19th, at the Ordway. Do what you can to go see it. It is a really fun night out! October Theater Preview on KFAI - Part Two! October Theater Preview - Hear it on KFAI Radio!